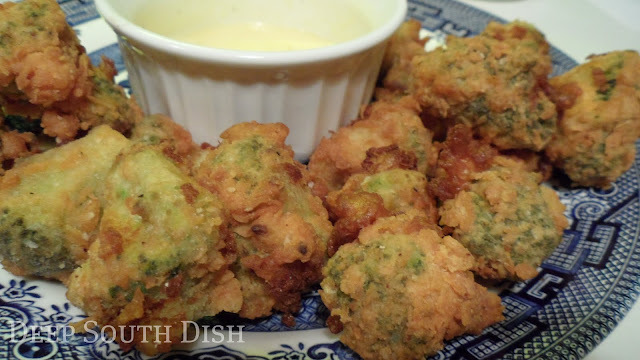 Broccoli florets dipped in batter and tossed in seasoned flour, then quickly deep fried - a crunchy on the outside, tender on the inside appetizer. Okay. I'll be the first one to tell you to eat your broccoli steamed, and tossed with a bit of minced garlic, maybe some red pepper flakes, little sea salt and a pat of pure butter. It's my favorite way to eat it. Broccoli is a power house veggie that is loaded with good stuff. So, in other words, don't go puttin' deep fried broccoli on your plate as a side dish. It's meant to be an appetizer folks, and enjoyed, like most other things such as this, in moderation. If you happen to already like broccoli like I do, you will love it like this. Serve them with plain ole ranch dressing, or a nice dipping sauce like cocktail sauce, comeback sauce, remoulade sauce, or maybe a spicy honey mustard sauce. Preheat deep fryer to 375 degrees F. Beat the egg and milk together, add 1/2 cup of the flour and whisk together well to blend. Mix the remaining cup of flour with the salt, pepper, and Cajun seasoning. Dip the frozen broccoli florets into the batter, then hold it up over the bowl, allowing it to drain well. Toss in the seasoned flour. Drop the broccoli carefully into hot oil and fry until golden brown, taking care not to overcrowd. Good just as they are, or serve with ranch dressing, cocktail sauce, comeback sauce, remoulade sauce, or a spicy honey mustard sauce. Beer Battered: Substitute a good quality light beer for the milk. Cook's Notes: Use as a batter for other vegetables such as whole mushrooms or green beans. I use frozen broccoli for deep frying mainly because I think they work better and it's a freezer staple in my house. If you want to use fresh, raw broccoli, you'll first need to cut it into small florets, then blanch them about a minute in boiling water to partially cook them. Transfer to an ice water bath immediately to stop the cooking process, the let them dry thoroughly before proceeding. 27 HUNGRY PEOPLE COMMENTED. ADD YOURS! now this is some broccoli I think I would really like! this is defnitely one way to get your kids to eat their veggies! genius! Well deep fried asparagus is one of my favorite appetizers, so this isn't much of a stretch. I'll have to make it for Trevor, my broccoli fiend. I've never had these, but wow, do this sound like an awesome way to prepare broccoli! What a keeper! I certainly would not advocate this as a regular thing, but it's nice for a change... or for a party! Just finished eating the deep fried broccoli. It was better than I expected it to be. This recipe will remain in my recipe folder for a long long time. Thank you for posting it. You're so welcome! Not something we'd want to eat on a daily basis of course, but surprisingly tasty isn't it?! I'm glad to hear you enjoyed it too! I made this tonight and it was awesome!!! I used creole seasoning instead of cajun because it was all I had lol But it was delicious!! I put a little extra seasoning in the batter, and sprinkled the broccoli fresh out of the fryer with it. My kids loved it too!! So glad y'all enjoyed it! Try dipping in hollandaise sauce. Delicious! I had a version of this in a local restaurant, and I have since made it at home. Deep fry the broccoli, then cover in your favorite barbecue sauce, sprinkle with chopped spring onion and with crumbled bleu cheese. So good with sweet chili sauce! They are a nice treat aren't they? Oh yeah, heat & sweet! This recipe was the bomb!!!! My girls and I ♥️♥️♥️‘ed the taste. Only thing different I did was add a little of the seasonings to my batter mixture! Will definitely make this again!!! Great idea! Glad y'all enjoyed it. Just a little something different. Just made this. Thank you. You are the bomb.com. �� I ate them with ranch dressing for dipping. Delicious.